Do we really need to give them a label or call them by a certain name? The quick answer is “Yes!”. While they all have some strong similarities, they have some significant differences that separate how they are designed, built, managed, and function. If you look up Google’s definition of a pond, some common phrases will come up such as a quiet body of water; smaller than a lake; depression that holds water and more. When you inquire about building a pond on your property, consider doing more research before telling your contractor to “just build me a pond“. You may not get what you wanted. Let’s dive right in. Identify the primary goals and activities you want to accomplish with a new pond. If we break it down to just as the names describe, do you want it mostly for swimming, fishing, or wildlife? Swim Ponds – Growing in popularity, these ponds focus on that backyard swimming oasis. sound water quality, good water clarity, low fertility and productivity, free from nuisance aquatic plants and algae. Typically these ponds average 15′ maximum depth, have a designated sand beach entry, and defined shorelines lined with decorative rocks or edging. Most often a synthetic liner is utilized to aid in construction options and water containment. Additional equipment such as aeration/mixing systems; injection pumps, and wetland filters are added to improve the overall quality of the water. Swim rafts, diving platforms, sand volleyball courts and other recreational features are added to enhance the experience. Fish Ponds – The typical pond that’s been around forever. Often referred to when thinking of Grandpa’s pond. These ponds vary in depth but ideally should be deeper than 12′ and up to 30′ deep at times. Various fish species ranging from common largemouth bass, bluegill, trout, walleye, and others are all stocked and/or naturally occurring. Aquatic vegetation is common and often desired for habitat, food, and cover for fish. Depending on the time of the season, these ponds can contain algae blooms due to the higher fertility levels desired to grow trophy fish. Prior to heavy regulation, these ponds were built by excavating in or near wetlands; damming a small stream or spring, or lining with clay. Today, many conditions exist to still obtain water naturally, but regulations have minimized how and where ponds can be built. With the increased opportunities utilizing synthetic pond liners, many of these types of ponds are being built in uplands and the liner is installed to overcome the soils inability to contain the water. 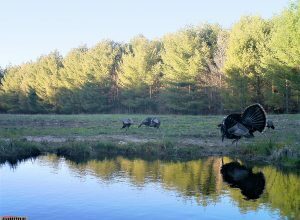 Wildlife Ponds – Often referred to as scrapes, these ponds are the most plentiful in existence. Wildlife ponds can be wet for all or part of the year. Their primary benefit is to serve as a drinking source for wildlife. Due to many their many characteristics, certain wildlife utilize these ponds and make them their home. Recreational industries are creating these ponds for the sole purpose of attracting wildlife by improving the habitat on their land. Wildlife ponds are quite different in design characteristics than fish and swim ponds. Typical depths range from 3-6′; contain gradual slopes, and are most productive when containing dense shoreline and submersed native aquatic plants. Typically these ponds “freeze” out in the winter and don’t contain a fishery. Construction generally consists of creating a small depression which is allowed to fill with surface runoff. When soil conditions aren’t capable of holding water such as sandy coarse soils, synthetic pond liners are utilized. With improvements in pond lining technologies, it is possible to create habitat ranging from small water holes to diverse wetlands spanning multiple acres. Creating a pond can appear to some, to be pretty basic and straightforward. However, if you don’t define your goals, the pond you create may not provide the benefits you were hoping for. It is important to consult with a professional who understands the difference in the construction requirements to achieve the goals of your pond. Yes, you can swim in a fish and wildlife pond; and yes, wildlife will still check out a swim pond; however, if you don’t define your goals you will not be maximizing your investment by digging the wrong type of pond. Wisconsin Lake & Pond Resource, LLC specializes in constructing ponds of all types. We will start out by defining your goals; evaluating your site, and helping you create the pond you desire.